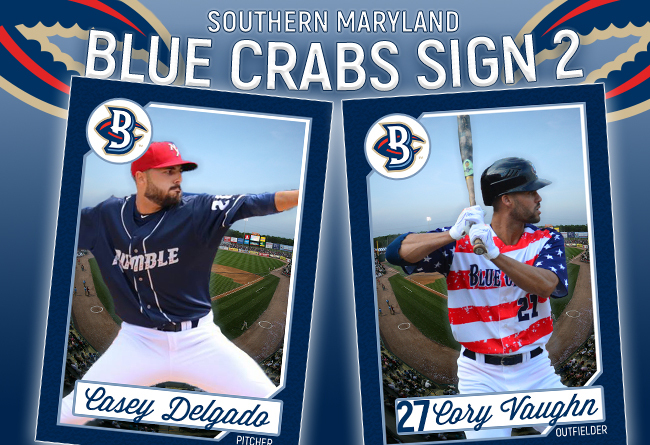 (Waldorf, Md., Feb. 28, 2018) - The Southern Maryland Blue Crabs have resigned outfielder Cory Vaughn, as well as newcomer RHP Casey Delgado, for the upcoming 2018 season. Vaughn will return to Southern Maryland after an All-Star showing during the 2017 season. The outfielder began the season in left field, before finding an every-day home in centerfield in May. The winner of the 2017 Blue Crabs Gold Glove award led the Blue Crabs in fielding percentage and outfield assists last year. After finishing the first half of the 2017 in the top 10 of the league in runs scored, doubles, walks, and on-base percentage, Vaughn earned a spot in the starting lineup for the 2017 Atlantic League All-Star Game. Prior to joining Southern Maryland’s roster, the 28-year-old California native played for the New York Mets organization from 2010 to 2015. During the 2012 season, Vaughn posted career-highs in stolen bases (21), RBI’s (69), and runs scored (73), earning him a spot on the MILB.com Organization All-Star Team. The San Diego State University alum also spent a season with the New Jersey Jackals of the Canadian-American Association in 2016. Vaughn appeared in 90 games for New Jersey, hitting nine homeruns and stealing 13 bases, while leading the team in doubles and outfield assists. Delgado becomes the latest addition to the Blue Crabs 2018 pitching staff. The right-hander began his career in 2013 with the Frontier Greys, a road-only team of the Frontier League. In 2014, the Miami native joined the Traverse City Beach Bums, going 7-6 with a 3.25 ERA, striking out 118 batters in 116 innings. This performance was enough to earn the Traverse starter a trip to the 2014 Frontier League All-Star Game, working one scoreless inning in relief for the East Division. This provided Delgado his first chance with an affiliated team, signing with the New York Mets organization in 2015. The young starter went 8-4 with a 3.17 ERA, spending the season at the single-A level. Delgado then started the 2016 season at the A+ level, going 8-3, while posting a 3.39 ERA. This warranted the Austin Peay alum a call up to the Double-A Binghamton Rumble Ponies to finish 2016. Delgado appeared in 37 games at the Double-A level across the last two seasons, going 15-11 with 126 strikeouts.